There is a specific consumer demand for recycled writing paper, which may even lead to the price for recycled writing paper being higher than the price for writing paper from virgin wood pulp (Williams 2005). At the global level the overall paper consumption is growing, although there are signs of a potential decline in paper use in the OECD countries, which may be due to an increase in use of electronic media (Hetemäki et al. 2014). Paper can be recycled a number of times by breaking down the old paper, called “scrap paper”, to pulp. To the recycled fraction is added a fraction of paper pulp from wood pulp (virgin paper pulp), since the recycled fibers will inevitably be shorter due to the (mechanical or chemical) breakage of the original fibre bonds (Wikipedia 2015). As environmental concerns increase worldwide, recycling paper has received an increased attention from NGO’s and governments alike (see e.g. WWF Global 2015). 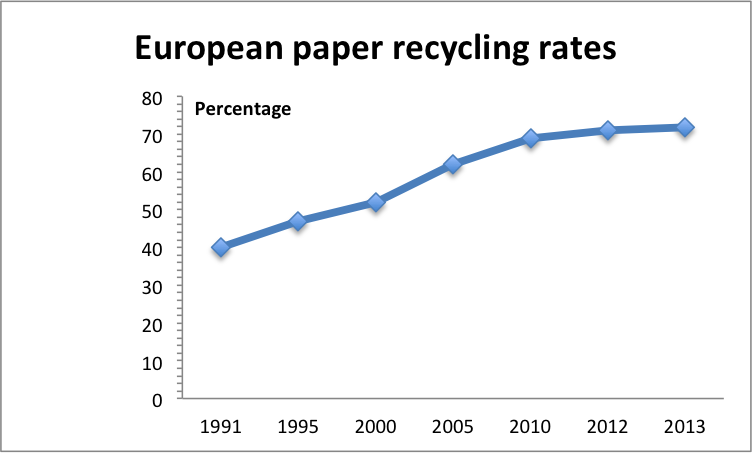 Postconsumer paper recycling has increased in Europe for the last 15 years, and is now at a rate of around 70 % (European Paper Recovery Council 2015). Even though recovery schemes, such as the European, have resulted in a higher level of recycling, there is a finite amount of paper waste available. If there is an additional (marginal) demand for recycled writing paper, the additional amount of recycled pulp therefore comes from a reduction in supply to the other customers in the market for scrap paper/recycled pulp, which therefore must compensate by an increased supply of virgin pulp, in order to maintain the market output constant. Figure: European recycling of paper. Source: European Paper Recovery Council. Accessed 9. September 2015 (http://www.paperrecovery.org/fact-figures/facts). The European Paper Recovery Council gives a good overview of the current paper collecting policies. European Paper Recovery Council (2014). Recycling is at 71.7%. http://www.paperrecovery.org/newsmanager/95/79/Paper-recycling-in-Europe-at-71-7/ (accessed 9. September 2015). Hetemäki L, Hänninen R, Moiseyev A (2014) Markets and Market Forces for Pulp and Paper Products. In: The Global Forest Sector: Changes, Practices, and Prospects (Eds: Hansen E, Panwar R, Vlosky R.). CRC Press, Taylor and Francis Group. pp.99-128. http://www.researchgate.net/publication/259289511_Markets_and_Market_Forces_for_Pulp_and_Paper_Products (accessed 9. September 2015). Wikipedia 2015. Paper recycling. https://en.wikipedia.org/wiki/Paper_recycling (accessed 9. September 2015). Williams P T (2005) Waste treatment disposal (2nd ed.). Willey. P 160. https://books.google.dk/books?id=ZH9kkhd56IcC&dq=consumers+demand+recycled+writing+paper&hl=da&source=gbs_navlinks_s (accessed 9. September 2015). WWF Global – Pulp and Paper. http://wwf.panda.org/about_our_earth/deforestation/forest_sector_transformation/pulp_and_paper/ (accessed 9. September 2015).